In business, the growth of a product or service is often represented on a life cycle curve in the shape of an “S”. 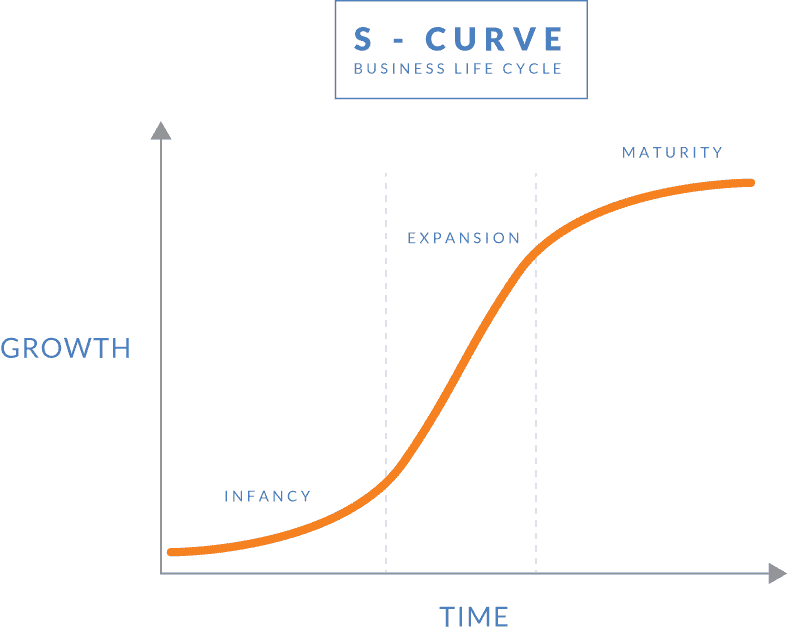 As noted in this basic S-curve model, during the infancy stage of a product or service, the growth curve is relatively flat or increasing slowly as only first movers and/or wealthy consumers purchase the product. As economies of scale take hold, prices decrease and the product or service becomes mainstream, the curve enters the expansion stage and begins to greatly accelerate upward. Eventually, the curve begins to flatten as the product/service approaches maximum penetration – the maturity stage. A great example of this concept is the automobile. At the time Henry Ford developed the Model-T assembly line in 1907, less than one percent of the population owned a car – the extremely wealthy. Mass production enabled cars to be built and sold more cheaply. With the addition of installment financing, the growth curve for the automobile exploded upward. By the 1950’s, the suburbanization of America was in full swing and the U.S. was approaching one car per household. According to the U.S. government, car ownership peaked in 2001 with 1.1 cars per licensed driver in the U.S. and has declined slightly since that time. In terms of mobile phone service, the growth curve is measured by the number of subscriptions for mobile service compared to the total population within a given market. The growth curve for mobile subscriptions is very similar to that of the automobile with two distinct differences. The first is that it occurred much more quickly. What took nearly a century in the U.S. auto industry, transpired in just 29 years in the U.S. mobile phone industry. The mobile phone was introduced to U.S. consumers in 1985 and subscriber penetration reached 1.1 per person in 2014. The second, and more interesting difference is that the subscriber growth curve did not peak at 1.1 and appears to be continuing in the expansion phase of the growth curve. One would expect that as each market approaches or crosses the key point of 100% subscriber penetration, the sales of wireless subscriptions and handsets would decrease significantly. In other words, if the population of a country is 100 million and the collective wireless operators have sold 100 million subscriptions, then who is left to buy new subscriptions other than the ~10% who purchase a second phone to separate their work and personal lives. But this is not happening in wireless. At the end of 2014 the U.S. had 318.9 million people and 355.4 million wireless subscriptions or 1.1 subscriptions per person. But the wireless industry is not yet peaking or showing signs of flattening due to the advent of tablets and other smart devices which will lead to consumers having more than one connected device. According to Wikipedia, there are over forty countries with wireless penetration rates greater than the U.S., including Hong Kong at 240%, United Arab Emirates at 204% and several European countries, ranging from 114% in Belgium to 178% in Finland. 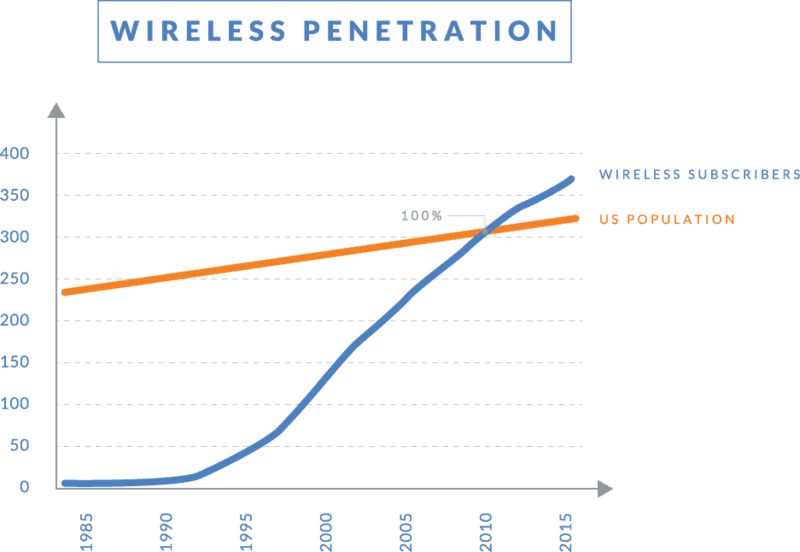 If this is the case worldwide, then it is safe to assume that the S-curve for wireless will remain in the expansion phase for the foreseeable future – that is very exciting. So if the S-Curve for wireless subscriptions is not beginning to flatten out and the industry appears to be headed to 200% penetration and beyond, then one might assume that wireless revenues are going to continue to rapidly expand as well. But that is not the case, and therein lies the challenge for the industry. Consumers are buying more devices that, according to Cisco, are causing the data traffic to double every twelve months. The same consumers are demanding better pricing. As the usage of wireless devices continues to evolve from its original usage of voice to data, and now to video, the gap between mobile traffic and mobile revenues will continue to significantly widen. 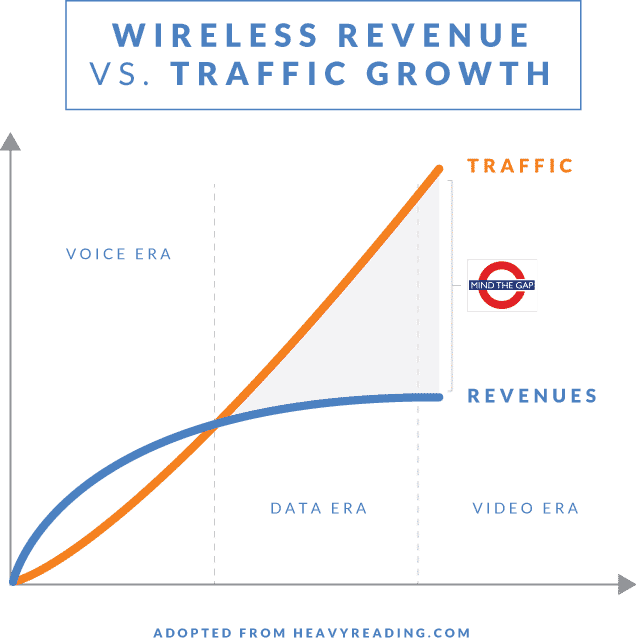 So the wireless industry is experiencing an unusual phenomenon – rapid growth in subscriptions, which is causing an exponential increase in traffic on the networks without the corresponding growth in revenue. Furthermore, if subscriber count is continuing to grow rapidly, then more and more devices require networks with more and more capacity, but revenue is not growing to provide the investment necessary to help the networks keep pace with the users. Unless costs are minimized and every opportunity for profit is maximized, this is an unsustainable predicament. How does the industry maintain growth in the subscriber base and the required investment in the network, all the while constrained by limited/flat growth in revenue? Typically, during the expansion phase of the S-Curve industries generate larger profits and find it easier to take in investment—both good things. However, with “excess” profits and easy investment as the norm, sometimes operational inefficiencies are ignored because the main focus is simply trying to keep up with growth. As long as profits and investment continue, these inefficiencies can usually be ignored without any immediate detrimental effect. However, sometimes what results is a mindset or a business process that is not as efficient as it could be because the “bottom line” does not need to be managed as closely. However, in the current economic environment, operational inefficiencies are no longer buried under expanding revenue. Operational and capital expenditures (OpEx and CapEx) are being managed more closely than any other time in the last 29 years. Md7 has always focused on wireless OpEx through a variety of cost containment and language enhancement programs for wireless operators throughout the U.S., Europe and other markets as well. Rent roll for cell sites remains one of the largest line items for operators world-wide. As markets cross the critical 100% penetration point, rent is becoming an even more key issue. And Md7 remains the world leader in negotiating cell site rents. But over the last few years, the team at Md7 has expanded its focus to issues that impact Capex – accelerating the time and lowering the costs involved in getting more technology on-air! The old models for site deployment that were developed 29 years ago have not evolved along with the technology. Everyday we focus on what we call “The Three T’s” – Talent, Training and Technology. We recruit great people (often from outside the industry) who bring a strong work ethic coupled with creative thinking. We train and retrain them well. And, we give them the tools to do their jobs faster and better. The team at Md7 has developed, and will continue to develop, revolutionary new processes and software to lead the development of cellular antenna sites into the new economic era and beyond. We look forward to a new year of growth and opportunity!